How your life can completely change in one week. Your entire life plan out the window. Your fears change. Your hopes change – everything gone. Start again. Stop. Start again. I’m a mum of four children. Happily married to gorgeous Ed the English backpacker/headhunter. Married almost 12 years and truly in love. My soul mate. We have three soccer mad boys aged 10, 9 and 7 and a daughter aged 4 called Ruby at the end. A pink blessing. A soft touch. A gorgeous strong beauty who came into lives after two miscarriages. And we’ve always seen her as nothing but a miracle. The one who cracked the blue code and completed our family. Ruby has always been easy going. Go with flow. Eat and sleep on the run. Dragged here there and everywhere. To soccer. To swimming. To karate. Smiling most of the way. Finally at three years old coming into her own where Ruby started preschool ballet and swimming lessons. And at four she was a nipper climbing the big rock and splashing in the sea. I was even back at work. Ten years off with the kids and landed myself an awesome job in the city where I was actually celebrating my one year anniversary. I started yoga and namaste was a part of my new vocabulary as was shopping for work clothes at lunch time. We hired an au pair from Spain. My mum lived down the road and helped lots. Life was lovely. Busy but lovely. Money was rolling in and overseas holidays booked. Smugly Ed and I sat and smiled of a night clinking our wine glasses filled generously with Hunter Valley rose – cheering to us. Eating our thermomix meal – mushroom risotto anyone? Our biggest uncertainty was what High school to send our eldest son to (still two years to go) and could I make it to spinning at the gym in the morning if I had a second or third glass of wine? Then life came crashing down. Monday 14 March 2016. My husband picked our daughter up from preschool early. She wasn’t well. Lack of energy. Very pale. She had been tired for a week or more. Took her to our GP and requested a blood test and then bought sushi (her favourite) and went home. Why a blood test? Our second son had been low in iron and we thought history repeats – time to buy some iron supplements. Just wanted to double check first. The usual chaos of a Monday night ensued. Bath time. Soccer practise. Cramping legs. Hungry boys. And then my gp knocked on the door. What? Why was she here? The look on her face I will never forget. She Told me to immediately go to Randwick children’s hospital. They were expecting us. Go now she said. I threw a bag together with nothing that I needed. Plucked Ruby out of her warm bed where moments ago we had been reading the hungry caterpillar. Told ed as he quickly logged off his computer where he had just sent a work proposal to his boss. Jumped in the car with Ed in the drivers seat and screeched off leaving my au pair and mum in charge. Emergency at Randwick children’s hospital on a Monday night was quiet. Thank goodness. We were greeted with urgency and knowing. I did not have their knowing but knew something was wrong. Ruby was giggling. Her very pale face was still smiling. She thought it a fun adventure. But knew something was wrong. Doctors scurried around us. 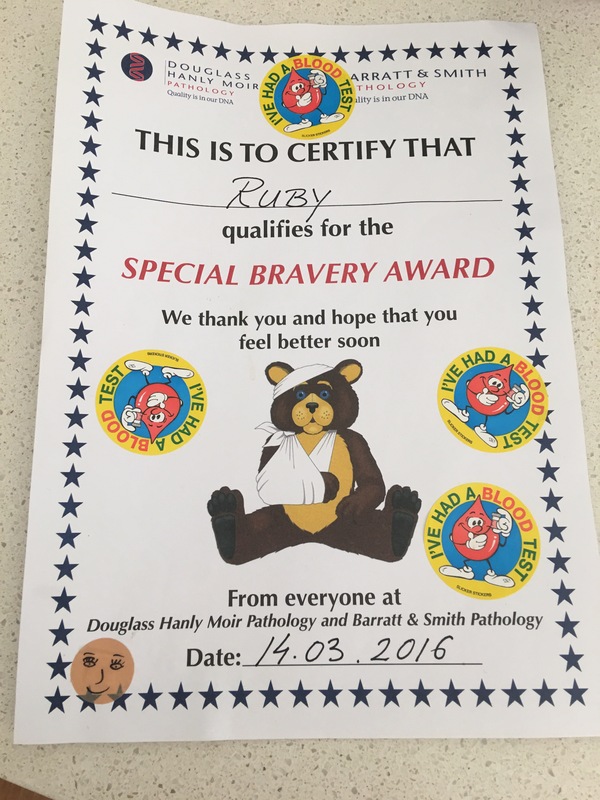 Nurses collected craft and played with Ruby. So patiently and beautiful and lovingly. We all felt loved. As the biggest blow was delivered to us. We believe your daughter has leukaemia said the doctor in charge. If I am wrong I will be happy but I am pretty certain I am right. I reached for my husbands hand in disbelief. He will be wrong thought a small Part of my brain. But sadly he wasn’t. We were taken to the kids cancer ward hours later for a week of tests information overload horror love and friendship. My eyes have been burning ever since. My stomach in knots. My heart broken. My head scrambled. Trying to come to terms with the news. Our new life. Our future. Looking into Ruby’s eyes all I could see was strength. Power. Acceptance. She knew without me telling her that she was ill and she was ready. I needed to catch up. The kindness has been overwhelming. From camp quality and their puppet Dean. Redkite social Workers and music therapists playing Frozen and bringing music into our hearts. The clown doctors who are so incredibly funny. Kylie the play therapist who has a cupboard of unending craft and smiles and love. The dog lady with the cutest and softest dog ever. And Captain Starlight and captain Rainbows – what a team. Thank you. And thank you to the nurses at Randwick. Every single one of you so patient and legitimately caring. Thank you for the hugs. The love. The information. The smiles. You are all amazing. 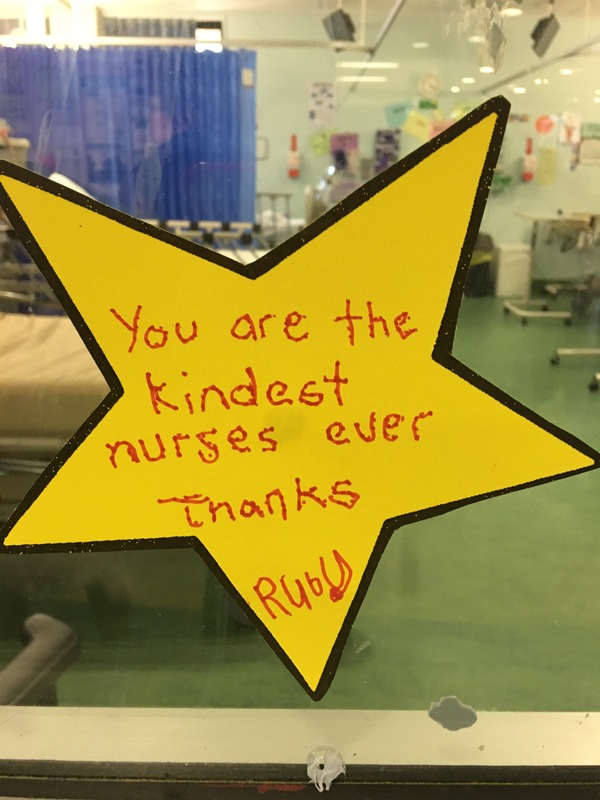 That hug on my first morning here from one nurse i will never forget. The instant coffee you gave me – now that’s forgettable. Luckily I’ve found a cafe downstairs. Coffee addiction hasn’t changed. The simple things. ** I have since re met the beautiful nurse that gave me my first hug and cup of coffee. Her name is Chloe. Thank you Chloe. Your kindness will Forever be in my heart. Thank you.